SallyeAnder Soaps are handmade in Minetto, New York using only the finest natural ingredients! 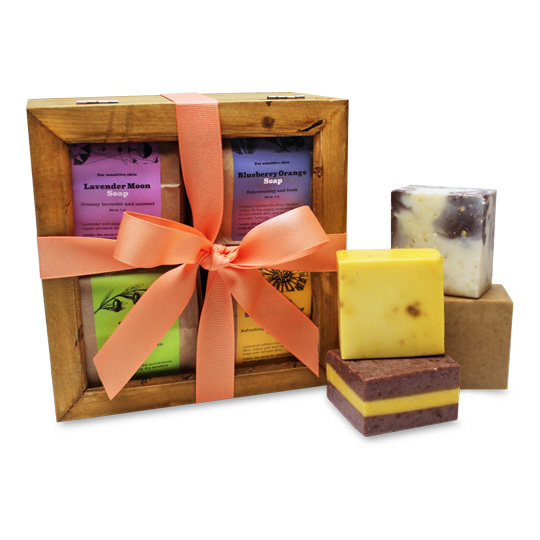 The soaps are created using only edible ingredients and are safe for all ages! The soaps are also 100% bio-degradable! The products contain: NO parabens or alcohols, NO sodium laurel sulfates, NO artificial dyes, NO synthetic chemicals or foaming agents, NO artificial or "fragrance quality" essential oils, NO coconut oil or palm kernel oil, NO animal products, and they NEVER test on animals. This crate contains 4 of the handmade bars. Scents may vary upon availability.